I love doing center work with my students. I have such a variety of learners and center work is a great way to reach all of them...plus they really enjoy them! 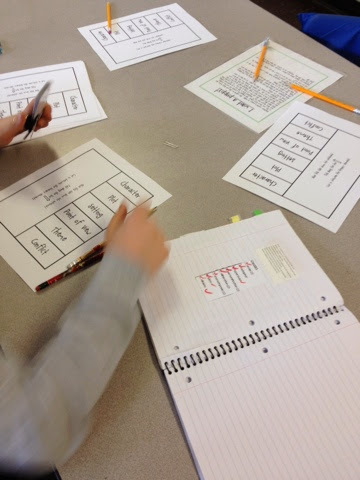 There were six centers based on a variety of ELA related topics. The first center is a parts of speech foldable. There is a direction sheet, the parts of speech and definitions, and story books to find examples. 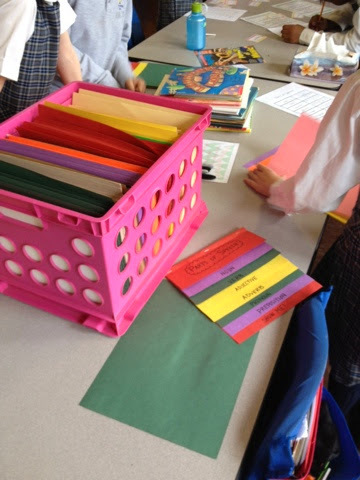 The students built the foldables according to the directions, copied the definitions, and then looked through the different books to find examples of each part of speech. Click here to see this resource from TPT. The next center is on synonyms and antonyms. 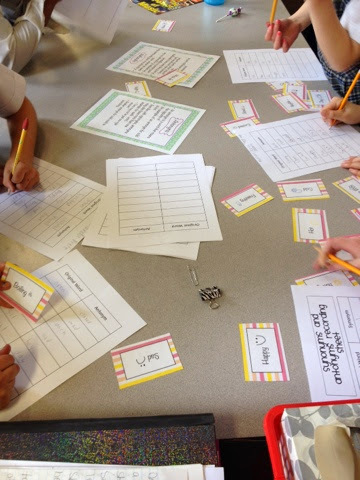 There are two "anchor charts" to remind students what synonyms and antonyms are, cards with words, and a recording sheet. The word cards need to be matched up there are synonyms and antonyms for each. Then they moved to the literary elements station. 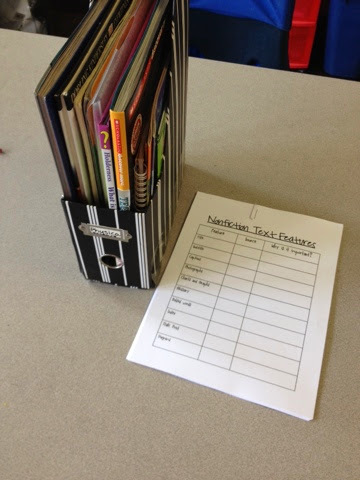 This station has a foldable for their reader's notebooks, a story, and definition cards. The students first need to cut the foldable, put it into their notebooks. Next they match the literary device cards with the definitions and copy it onto the foldable. 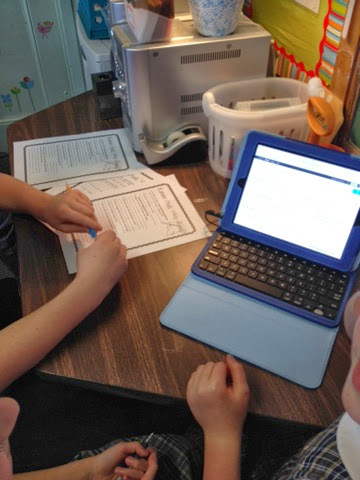 The last step is to read the story and write examples of each device onto the foldable flaps. My students do a lot of work with dictionaries. In this station they used the dictionary to look up spring words and answer questions related to the entries. Any time I bring out the iPad the kids go insane. This station is a webquest on mythology. The link is for a teacher made page (there are a few grammar mistakes on the page, but it is easy to navigate and safe for kids). I had four students at this center working together. They had a blast. 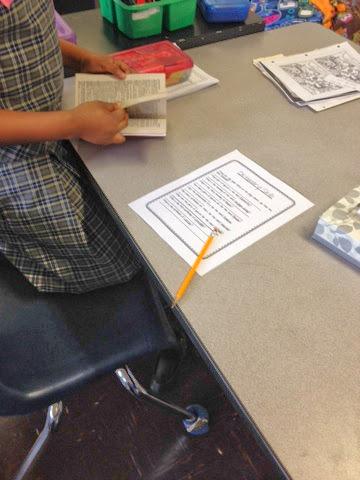 The final center is a nonfiction text feature scavenger hunt. I put out science related nonfiction books and had the students look for the features, mark the source, and explain the importance of the feature. I love seeing the kids move around to the different centers. It's a nice way for them to get up and move around...especially for those fidgeters! On another note...I celebrated my 30th yesterday and got a new camera! I am so excited! I have already put it to use a bit and can't wait to take it to the NSTA convention in Boston next week.